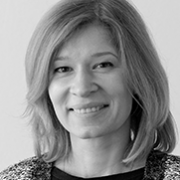 Liudmila has more than 10 years of experience in leading international advertising agencies in Moscow. In her current position, she supervises the agency’s product, leads the creative department and is responsible for the development of Contrapunto’s philosophy and vision. Liudmila studied English and French at the Moscow State Linguistic University before joining Saatchi&Saatchi in 1996 as an Account Executive. She then worked as a Senior Copywriter at BBDO and later became one of the key members to launch the new creative agency Instinct/BBDO in 2003. In the following years, Liudmila worked as a Creative Director at BBDO, Instinct and Saatchi&Saatchi, and since 2010 she is helping develop the newly born creative branch of BBDO Moscow - Contrapunto. Liudmila is also a Member of the Board and one of the founders and strategy developers of the “Deti Nashi” Charity founded in 2006 in support of orphans and children without parental care.